Sjaak Swart (born July 3, 1938, in Amsterdam) is a former Dutch footballer who played for Ajax Amsterdam a total of more than 600 matches, a record for the club. Mister Ajax, as he is called, and rightly so. Because nobody played as many games for Ajax and Sjaak Swart. And probably will in the future none of the Ajax number of 463 league games for the club to get. Sjaak Swart, colorful and Amsterdam at heart, is still popular with the supporters. 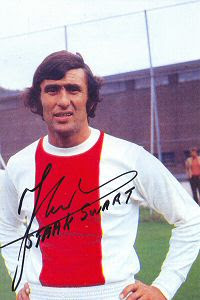 Swart's playing style was typical of Ajax and its reputation: a pure winger, technical, tactical and ball skills. Swart was productive in his years with Ajax 1 also. Not for nothing he is third on the list of goalscorers with 175 goals behind Johan Cruijff and Piet van Reenen. With Ajax Swart champion eight times, six times he won the KNVB Cup and was also the cup with the big ears' three times his share. In 1956 he made his debut in the first team of the club which he has since he was eighth paragraph. Typical of the right winger was his comment after the semifinal in the European Cup 1 against Benfica in 1972 where he later head the decisive goal scored. "I had to happen that way," he said dryly. Swart thinks Ajax, Ajax is alive and is the personification of Ajax. "If they come to Ajax, then they come to me," he explained. "It's a love for life." And that's probably exactly the reason that Ajax has entered him in the heart.